I was actually defending Kabam with this as well as the AA change, until I saw that they had in fact told the community previously that this was the intended function or one they intended to keep in place. That really changes things. If you're going to go back on something that was officially put out to the community before, you REALLY should issue some prior notice or maybe even open a discussion on the topic to get some feedback. This was pretty low-down. There is no "official" list of Champions that can avoid Mordo's Astral Evade, as none of them are really supposed to. Those 2 Hit attacks also don't always work. If there is a framerate drop sometimes the Astral Evade will still activate, so some older devices are not consistent with them. So, Drax, Archangel, Elektra, X23 should never avoid Astral Evade. 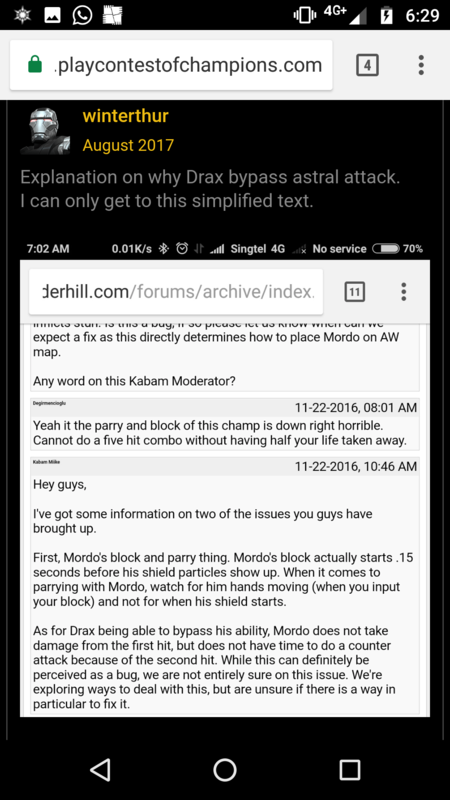 The problem is there was a post by someone at Kabam (I forget who) back in November or December of 2016 on the old forums that definitively confirmed that Drax was a counter. Those forums are no longer available. Ok, if there wasn't another one where they said something different I'll concede that. But the AA stun piece is very clearly backing out of what was said originally. They outright said that AA landing stun on immune nodes was "working as intended". I started this game in December 2016's last week. So... I can not say anything about the forums back there. It was asking if Drax's bypassing Mordo's astral evade was correct or not. The response was something to the effect of it was uninteneded, but Kabam liked how it was working so they decided to leave it. Another thread had come up about the timing that allowed Drax to do it, again it was confirmed that it was unintentional, but it did work and they were not going to fix it because it would introduce some knock effects that would be bad overall. 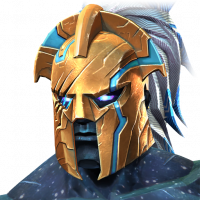 So, out of curiosity, are there ANY dimensional beings with Ability Accuracy reduction immunity? Only mystic or villain I can think of is Mordo, and he's not a dimensional being. The reality is they can change things whenever they want. The problem is notifying the community of when and why the change is occurring. Kabam needs to move from "this is not a change. Blade never worked that way against Mordo" to "Blade has been working this way unintentionally. We are changing it in the next release"
The community finding out by getting destroyed in fights because the game mechanics have been changed is a major problem. Kabam need to admit to the problem and get better. When they claim no problem exists it is becomes a double negative for the community. Not only did we get wrecked in a fight, but now we are being told what we experienced the last 8 months or more never happened. It is a real double gut punch with no hope of it ever stopping. Not to mention it only fuels the conspiracy theories and fuels distrust.